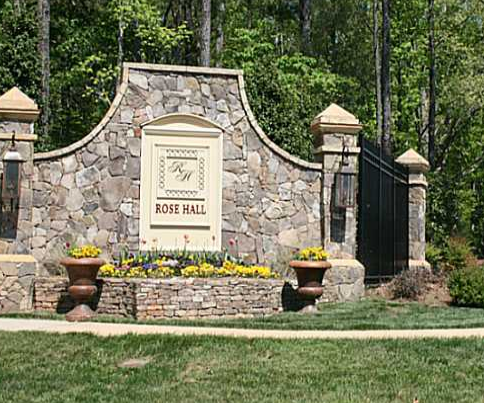 Rose Hall is an exclusive residential community in Raleigh, NC that is only minutes from Research Triangle Park, Falls Lake Recreation area and the cultural center of downtown Raleigh. The triangle region of North Carolina is well known for its center of businesses, research and development companies which are located between the cities of Raleigh and Durham. Duke University, University of North Carolina at Chapel Hill and North Carolina State University are all very close to Rose Hall. The Wake County Public School system for this area is one of the largest public school systems in the nation and has received multiple awards for its educational standards and service provided to public school students. The Raleigh Durham International airport is in this hub as well as many famous shopping malls and centers. Once a person is within the boundaries of the Rose Hall Subdivision, it seems incredible that the location is so close to the urban center of the Triangle area because it is nestled in a “forest by the city.” Within the development there are walking paths following a creek. At various locations along the path, attractive concrete benches are situated to enjoy the view and listen to the sounds of water as it flows over rocks. The home sites of Rose Hall range from a minimum of approximately one acre and can be as large as five acres. A team of accomplished builders and architects have completed a number of unique and stunning custom homes. The different architectural styles give this community interest and elegance. Most of the homes are larger than 5,000 square feet and contain four or more bathrooms and offer every possible luxury that would come to mind. However, since all of the homes are custom built for individual owners, the size of each home and the amenities included is the decision of each homeowner. There are a few gorgeous home sites remaining that are ready to build starting at $149,000. There are no completed homes in the Rose Hall subdivision that are currently available for sale. Executive home locations that are tranquil, secluded and still conveniently located for professionals with demanding schedules are scarce and becoming more so each day. A home in Rose Hall in Raleigh North Carolina can be built on a selected home site but these opportunities are limited and it would be wise to make inquiries as soon as possible.